Previous attempts had been made to seal off the Hudson from British interference. In 1776 a fort was set up on the northwestern tip of Manhattan and a twin across the river in New Jersey. The Manhattan fort was dubbed Fort Washington, where Washington made his headquarters during the Battle of New York and the New Jersey redoubt was called Fort Lee. The forts were equipped with artillery overlooking the Hudson and a line of chevaux-de-frise was sunk in a line between them. Chevaux-de-frise were large logs tipped with iron spikes that, attached to log boxes filled with boulders, would be sunk in the hopes that a ship passing over them would be severely damaged. Unfortunately for the boys in blue, their artillery was ineffective and the river was too deep for the chevaux-de-frise to be of any help. The British made several runs past the batteries during the summer of 1776 before driving Washington from New York altogether. Today the line of chevaux-de-frise between Fort Lee and Fort Washington are gone and in their place is the George Washington Bridge, connecting the New Jersey town of Fort Lee and the Manhattan neighborhood of Washington Heights. It is worth mentioning that chains and other obstructions across waterways were seldom, if ever, intended to stop a vessel in its tracks. Typically they were meant to slow a ship down so that artillery covering the area could be much more effective. The chevaux-de-frise between New York and New Jersey were covered by Forts Lee and Washington. The chain at Fort Montgomery lay in the crossfire of Forts Montgomery and Clinton. The Fort Montgomery chain, stretched across a narrow section of river at the southern end of the Hudson Highlands, was originally created for service much further north. Forged at the Ancram Ironworks (New York State’s first ironworks) it was brought into being with the intention of being laid across the Richelieu River, just below the St. Lawrence River, thus preventing the British from sailing into Lake Champlain. By mid-June of 1776, a Patriot advance into Canada had stalled, the victims of a smallpox outbreak as well as lousy weather with significant flooding. With the water level so high the chain would be impossible to install and the decision was made to send it back south. It was thought it could be used to sever Lake George from Lake Champlain, but the torrents made this impractical as well. So south it went, to Fort Montgomery. Under engineer Captain Thomas Machin, the chain was first installed on November 1, 1776, although it quickly broke free from one of its moorings. It was permanently fixed the following spring and lasted until the British overran the fort that fall. The chain was never tested by the British Navy; the attacking redcoats came the long way: over the mountains behind the fort. The Colonists would have to re-focus their defensive efforts further upriver. While Machin recovered from a wound received during the Battle of Fort Montgomery a half-hearted attempt was made to lay another line of chevaux-de-frise across the river between Newburgh on the western shore and Pollepel Island on the east, but this was never completed. Once back in action Machin completed a hasty survey of the Highlands looking for another location for a chain. He found it, about five miles north of Fort Montgomery where the Hudson narrows and makes an abrupt 90-degree turn to the west. The terrain on the western side of the river was so abrupt it was referred to as Camp West Point. Despite needing 300′ less chain than was required to bridge Fort Montgomery, the West Point Chain would have to be made of stronger, larger links. The river narrowed considerably as it passed West Point, thus increasing its speed and the amount of force the chain would have to withstand. The furnaces at Ancram, while producing a decent product, were just too small. There was only one place that could handle a job this big. 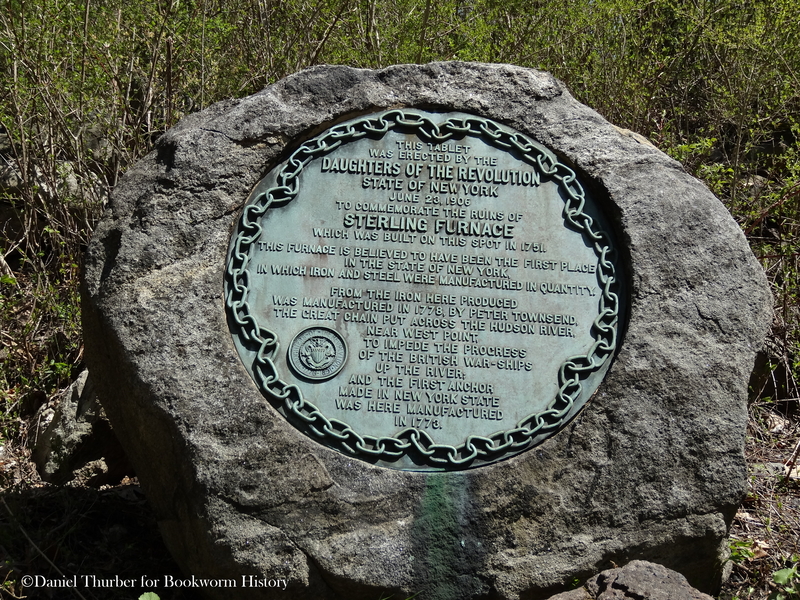 There had been an ironworks at Sterling Lake, New York since 1732, although the initial operation was much smaller. Started by Cornelius Board and Timothy Ward, the original works only consisted of a small bloomery. It wouldn’t be until 1751, when the works were taken over by father-son duo William and Abel Noble, that the first furnace would be installed on the site. In 1768 Peter Townsend married the daughter of one of the Nobles’ partners and eventually inherited the whole operation. By 1777 Peter Townsend and Noble, Townsend, & Co. were producing high quality iron shot and artillery for the Continental Army. The problem with contracting a chain from them was that the Army already owed Townsend a great deal of money, to say nothing of the workers he was losing to recruitment. Eventually negotiating terms with Machin (at a cost of over £19,000, around $92,000 Continental, along with exemptions to keep enough workers to staff the works) Townsend agreed to produce a 750-link chain, each link weighing around 130 lbs., a feat he would accomplish in just six weeks from February to March of 1778. The chain links’ journey from the forge to the river was no less impressive a feat than their creation had been. Loaded onto oxen-pulled sledges, the links made their way from Sterling Lake through the snow-covered hills to meet the river just below present-day Newburgh. From there they were loaded on rafts and sent downstream to West Point where the great chain was finally put into place on April 20, 1778. The chain was supported across the river on several rafts of pointed logs. A boom (long, horizontal “ladder” of large log “rungs” spaced about four feet apart and held together by chains) was stretched across the river slightly downstream of the chain to provide further obstruction to ships. For the next five years “General Washington’s watch chain” (as the Americans jokingly referred to it) would be installed across the river every spring and taken in every fall. By 1778 the War had moved further south and although defense of the Hudson was still a priority to the Revolutionaries, the British had other targets. Thus the “Yankee pumpkin vine” (as the British called it) was never tested by hostile vessels. The spring of 1783 saw the war essentially over and with only political formalities remaining the decision was made not to install the chain. It never saw active use again. Today several relics of the effort to secure the Hudson can still be found. A pair of boom logs was pulled from the river in 1856 and today resides at the Washington’s Headquarters State Historic Site in Newburgh, NY next to a point from one of the Pollepel Island chevaux-de-frise (which got caught in an anchor in 1827). In 1830 51 links of the Fort Montgomery chain were brought up from the deep by three rivermen searching for a lost anchor. The links were brought to New York City where 50 feet were sold to a newspaper with other links going to several museums. Some of these can be seen at the Stony Point State Historic Site as well as the New-York Historical Society. The ironworks at Sterling Lake have had a tumultuous history as well. The furnace that produced the chain iron continued to roar until 1804 when a larger furnace rendered it superfluous. In 1864 the works, mines, and surrounding property were sold to the Sterling Iron and Railway Company. Production slowed between 1890 and the start of World War I, with the furnace being shutdown altogether in 1891 although mining at the site still continued. In 1918, seeing opportunity from the war, Ramapo Ore Company leased the mines for the next 50 years. Ramapo Ore would modernize the site, installing new equipment, facilities, infrastructure, and housing for over 300 employees. Their optimism was not to be rewarded however and in 1923, following diminished demand after the war, the mines closed for the last time. The remains of the Ramapo Ore Company can be seen on the site, from the remains of Lakeville, the company’s mill town, to the mining facilities, to the entrance to the mine. The mines extended deep under Sterling Lake and although they were dry while in production (thanks to several pumps) today they are all flooded. The only indication of where the entrance was is a set of rail track extending up out of a pool of water. As for the furnace that produced the iron for the Great Chain, it had fallen into disrepair by 1806 and utter ruin by the latter 19th Century. 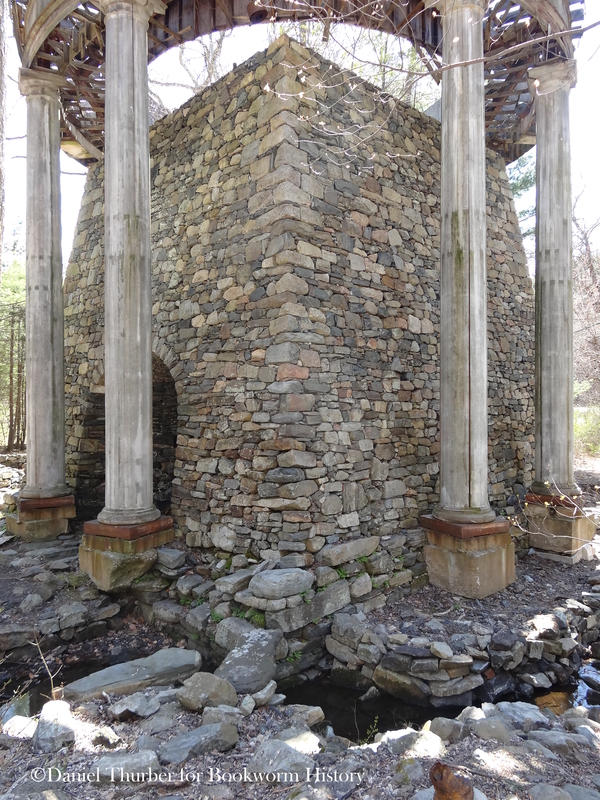 In 1952 the City Investing Company purchased the lands with an aim to developing them, but only made it so far as rebuilding the furnace (as a symbol for what they hoped to accomplish with the site). 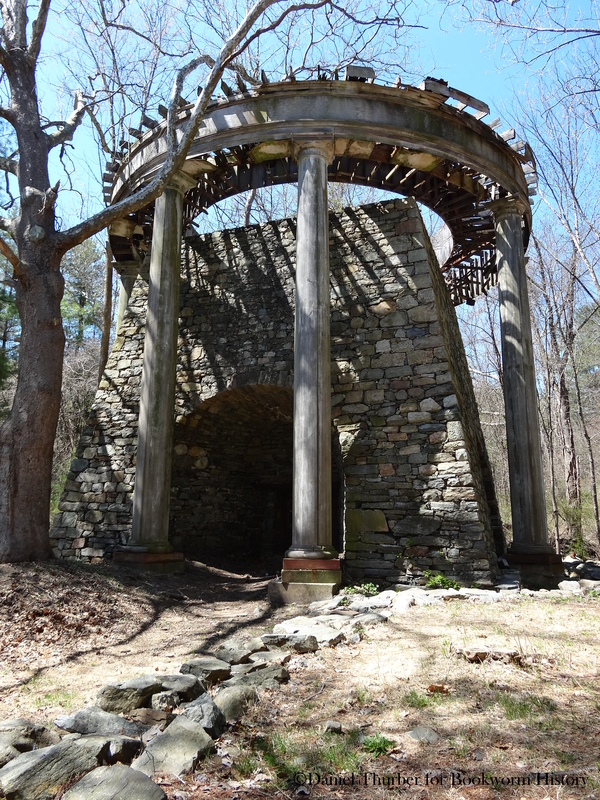 When they rebuilt the furnace, they installed a neo-classical frame around it that originally held a dome overhead. Since then the dome has disappeared, along with the City Investing Company’s plans. The area became part of the New York State Park system in 1998. So what happened to the Great Chain? Following the signing of peace treaties the newly formed Congress had several requests from ironmongers for the purchase of the chain for re-smelting. Although gone from the States, Great Britain still held Canada and paranoia was running high that such proximity would lead to another war and another need to secure the Hudson. With this thought firmly in their heads Congress held on to the chain and it sat rusting on the riverbanks at West Point for 20 years. In 1803, with the establishment of the United States Military Academy, the chain would be moved from the shore to the newly built Ordnance Compound where it was probably more in the way than anything else. It would remain there until 1829 when the US Government would sign a contract with a local foundry for the sale of the chain. Most of the 60 tons of Revolutionary relic would be melted down for the bargain price of $2,000. Some links survived the fire. The most notable of these are at the U.S. Military Academy installed at Trophy Point, just above where the chain was secured during the war. Twelve links connected with a ball and clevis are secured in a circle, forming an unusual and poignant memorial to both the dedication and ingenuity of those who fought for the country’s creation. For more information (and just a darn good read) check out “Chaining the Hudson” by Lincoln Diamant.